On Which Continents Do Raccoons Live? The raccoon was one of many exotic new species discovered by explorers to the New World. According to PBS, Christopher Columbus was the first person to write about the species Procyon lotor, which is native to the North American continent, but can also travel as far south as the northern countries of South America. In recent years, raccoons have also been imported to parts of Europe and Japan. 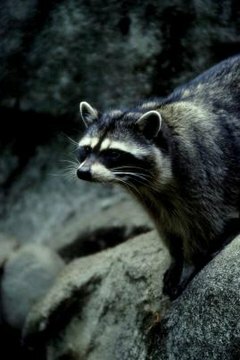 Racoons are medium-sized nocturnal mammals covered in grayish-brown fur, with bushy tails covered with several dark rings. Their faces are marked with dark rings around the eyes that resemble a bandit’s mask, which is appropriate considering that these opportunistic omnivores have an affinity for stealing food from campsites, garbage bins, outdoor pet dishes and anywhere else they can find it. Raccoons are also notable for having five dexterous toes on each of their front paws. These are capable of grasping like fingers, allowing raccoons to be excellent climbers. Raccoons can be found natively throughout most of the US and Canada, as well as in parts of Latin America, from Mexico extending down to the northernmost regions of South America. They are typically found in woodlands and grassy areas, and are not found in the high Rocky Mountains or in the Southwestern desert. In the 1930s, they were also introduced into Alaska as part of the fur trade. According to PBS, raccoons originally inhabited the tropical regions of South and Central America and gradually migrated north, becoming acclimated to the cooler climates and food choices of what is now the US and Canada. In the early 20th century, raccoons were imported to parts of Europe, including Germany and Russia, as part of the fur trade. Later, in the 1970s, more raccoons were imported as pets in both Europe and Japan, where unfortunately many were abandoned and released into the wild as they grew up and lost some of their cuteness. As a result, both Europe and Japan have since become overrun by their respective raccoon populations. Although the high demand for raccoon hats and coats severely depleted the native raccoon population in the early 20th century, the species has since rebounded, thanks in part to breeding efforts by the US Department of Conservation. Today, this species is abundant in North America, and management efforts are underway to prevent them from becoming overpopulous. Raccoon hunting is legal with a permit in many states, along with live-trapping raccoons that enter your property. Hunting of raccoons is also encouraged in many parts of Europe, where officials are still seeking solutions to getting the exploded raccoon population under control. Can Raccoons Be Kept as Pets? What Are Some Types of Weasels? Are Dingoes an Endangered Species? Are There Rabies Shots for Raccoons? How Do Raccoons Adapt During Winter?